Lisbon is a very economic destination for visitors. Drinks, food and hotels are much cheaper than other European Capitals. Dinners can start at EUR 10 per person. EUR 30 will get you a very nice meal in a chic restaurant. 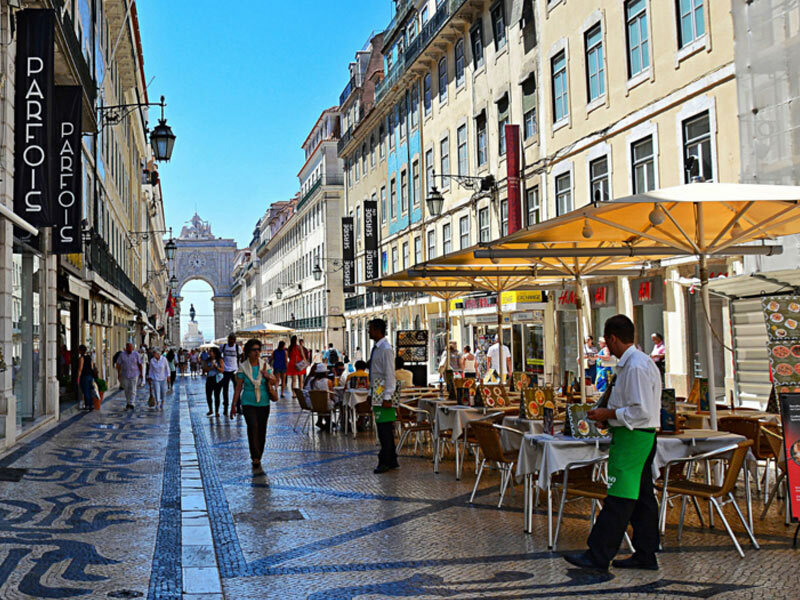 Al fresco dining is superb during the Summer Season in Lisbon. It’s wise to book ahead if you plan to arrive after 8pm. 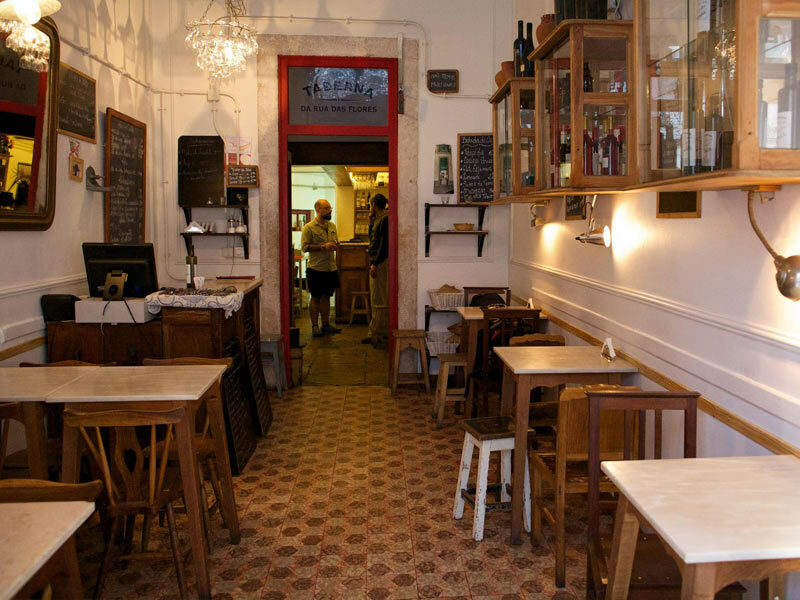 Pay a visit to Taberna da Rua das Flores for the best petiscos (think Spanish Tapas with a twist) in Lisbon. Foodies in Lisbon are spoilt for choice. Depending on the time of day, there are a wide range of restaurants to choose from. Breakfast in Portugal is light usually including just a pastry and coffee. Lunch is around 1 or 2pm. Dinner is a late affair in Lisbon, normally starting around 9pm. Drinks follow from 11pm or midnight onward. Locals tend to head to the clubs for dancing between 2 and 3am. The Mercado Ribeira is one of the city’s best markets featuring some of Lisbon’s finest restaurants and best produce. From chocolate to wine and liquors as well as the best seafood in all of Portugal, it is a foodies paradise with more than 30 shops and restaurants. There is also great terrace seating right by the river. Cafe A Brasileira (Rua Garrett 120) is a great coffee pit stop, and something of a gay hangout in the early evening. Although its carved and paneled wood interior is magnificent, camera-touting tourists tend to covet the outdoor seating. Gayloa is a fun steakhouse and bar next to Trumps with late night dining until 3am. Meanwhile, Louru & Sal is one of our favourite places for traditional Portuguese cuisine. In Portugal, pasteis are found on every street corner. Their home, however, is the bakery in Lisbon’s Belém district, which bears the name of the tart immortalised in the fado song. Pastéis de Belém, a family-owned business, has been making the tarts since 1837 and serves up to 50,000 a day in peak season. These are reputed to be the world’s best. They are distinguished from other pastéis de nata by their slightly salty and extremely crisp puff pastry – partly from being baked at 400C – and the custard, made only with milk, not cream, which is less sweet. Our editors have spent the past year researching the best places to eat! Here are our recommendations. Chef Dolores Lopes is justifiably proud of the menu she's created for Cafe Royale, an elegant Lisbon bistro. Lunch at Restaurante Espaço Espelho d'Agua, a wonderful eatery is served with an inspiring view over the river. Reservations are essential at Feitoria Restaurante & Wine Bar, a sublime 1 Michelin star dining venue. Comida de Santo is a colourful and lively restaurant has been serving up deliciously authentic Brazilian cuisine in Lisbon, since 1981. Louro & Sal offers a fusion of traditional Portuguese and modern cuisine with great wines and friendly service in Lisbon. Our restaurant recommendations are dotted all around the city and are worth the journey.